Whether you’re the type of mountain biker who likes to rumble along country lanes, or rocket downhill, there are times when the ground you’re on throws you unexpected bumps, ridges, or holes. Most of the time you’ll react in time, and in the right way to keep you upright and rolling on, but there may be times when you don’t. It’s all part of mountain biking, and it’s a big factor in what makes it so fun and satisfying… but it’s also the reason you need a good helmet. Head injuries are among the most serious, but they’re also among the easiest to prevent. Finding and using the right helmet for your riding style is the number one thing you can do to keep your head safe. Our review of the best mountain biking helmets includes a range of options from normal road to full-face. 【Removable visor】:With removable sun visor, if you don't need it,you can open or remove it. 【Comfortable and adjustable】:Rotary internal regulator adjusts the tightness of helmet. A good-looking helmet, comfortable and edgy. The BGE Mountain Bike Helmet by Exclusky is built with environmental consideration in mind, and optimal protection for its weight and coverage. It is unisized for 54-58cm. The visor is also adjustable and removable. It has 18 large vents, placed in lines from front to back, allowing a solid panel over key areas of the skull at the side and back. Air flow is still good, and the helmet is comfortable even in quite warm weather, and while working hard on rough terrain. All of the vents – not just the front ones – have mesh for protection from large insects and/or debris. The straps are fully adjustable and feature locking clips under the ears, to keep your sizing from slipping during rough riding, and a padded chin strap for comfort and for protection during the impact of a fall. There are no reflective features on this helmet, aside from the silver trim – which is more a style decision than a safety feature. There is plenty of room on the back of the helmet for reflective slickers or similar safety devices if desired. The overall style of the helmet is excellent. It looks edgy, sporty, and rugged. It gives both a sense of aerodynamics and speed at the front, and an open, airy feel as it wraps around the back of the skull. The silver trim and branding is not overdone, and when on it looks and feels comfortable and unobtrusive. A great-looking, light helmet with all the right features. 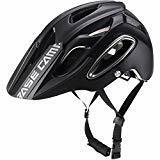 The Base Camp, by NEO, is a cool and comfortable mountain biking helmet. It is unisized for 54-58cm. The 18 large vents are well-placed for air flow and protection, and the front vents are mesh-covered for protection from large insects and debris. When riding, the helmet is cool and comfortable. The straps are fully adjustable, and lock under the ears to keep your settings from slipping. The straps on the white model get dirty pretty quickly, but despite some discoloration after cleaning, they still look good. The chin strap includes a padded sleeve for comfort during riding and added protection in the case of a fall. There are no additional reflective safety devices on this helmet. The white shows up well in off-road situations, but if you use it on the road you will probably benefit from adding a sticker or light to the back of it. The style is excellent. Once on, it looks a bit bigger than expected, but still cool and rugged. The black model is also a great style – and the straps look cleaner, longer. A stunning helmet that successfully sits on the borderline of road and mountain bike helmets. 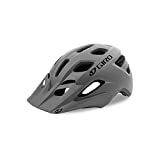 This hybrid road-mountain bike helmet by King Bike features polycarbonate shell and EPS liner, and two size ranges: M/L for 56-60cm, and L/XL for 59-63cm. It also comes with a carrying sack OR rain cover (at random). The 24 vents are placed for excellent airflow, but they enhance the styling too. The helmet can get a bit too warm on hot days if working uphill terrain – not enough air movement – but in all other situations it works fine. There are mesh barriers built into the front vents to protect against large insects and debris. The straps are comfortable and stylish. They don’t lock in place below the ear, which we miss, but there is an excellent chinstrap with more padding than most, so it’s very comfortable. The helmet comes with a light, to keep you visible and safe while riding off-road in a line, or on the streets for your commute to and from work, your off-road haven, or while running errands and getting in a little bit of additional pedal-time. The style is aggressive and cool. It rides the line between road bike helmet, and mountain bike helmet, probably leaning a bit more to the former, but still fitting in on the rough trails. What saves it is probably the little glimpses of carbon fibre print that peak out beneath the strong contours of the black outer shell. Great balance, strength, and sense of movement. This is a rare case that looks as good with the visor off, as it does with it on. There are fourteen styles and colours to choose from. A well-designed, great-looking helmet with nothing but trails and ruggedness in its sights. 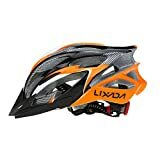 This mountain bike helmet, by Lixada, is constructed for light-weight and a cool feel, while taking accidental impacts like a champ. The thirteen vents are of ample size, and the design at the rear of the helmet allows them to open up for a vacuum-effect, while maintaining safety by way of the upper ridge. It’s a cool helmet in any riding conditions (as much as any helmet can be, that is). The straps are fully adjustable and include a padded chin strap. Though the clips under the ear do not lock your settings in place, they do feature a design that presses a peg-like protrusion into the strap when worn, reducing any slippage that might occur during the vibrations and knocks of riding. Settings are more likely to slip when there is no pressure on them – when the helmet is not being worn – but stay put while riding. They work pretty well. There are no reflective features on this helmet, but there is ample space on the back of the helmet to attach a reflector or light to the hard plastic outer shell. The style is rugged and pure ‘mountain bike’ – it looks as ready to hit the trails, as you feel. It comes in a number of great colours too. Unlike some lines, which seem to add colour options as an afterthought, we’d love to buy a range of these Lixeda models, and pick the style we want for the day and situation! A little indulgence, anyone? A hybrid road-mountain helmet that is a little too ‘road’ for our liking. A good helmet, no doubt, but more fit for a different purpose. This Pidien hybrid road-mountain bike helmet is made to be tough and eco-friendly, using PC shell and ESP foam. The 24-vent design helps to keep the rider cool on the road, but in more sheltered off-road situations – especially when slowly climbing – the helmet tends to get a bit too warm. The front vents have mesh over them to protect from large insects and debris. The straps are standard road-bike style, no locks under the ears, but they do have a padded chinstrap and adjust to fit well. The cradle adjustment knob is made of reflective materials, to increase visibility on roads – or off of them if there is a light source nearby. The high visibility yellow shell also helps improve your likelihood of being seen. 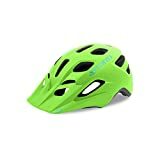 The style is very European, evokes the right images of road-races like the Tour de France, but to call this a mountain-biking helmet is a bit of a stretch. It will do the job, and look good doing it, but it seems just a little more at home on the tarmac than on the dirt and rubble of an off-road course. There are styling details that elevate it (the carbon fibre print breaking up the foam on the back), but it’s simply better suited for a different environment. A decent, low-cost helmet, but probably better in the road bike category. We’ve included a second helmet by Lixida: this little stunner in green and black (available in other colours as well). It is a unisize, fitting heads of approximately 56-62cm, and includes a detachable visor. The 25 vents are much wider at the outer surface of the helmet than they are at the inner edge, making the helmet appear very light and airy. In reality, the airflow is hampered a bit by the small inner holes. It’s not a massive problem, but if you’re wondering why the outside of this helmet looks like it’s made of gossamer? It’s made up for with added mass near the head. The straps don’t lock under the ears, but there is a comfortable chinstrap pad and a pleasing design. There are no reflective features on this helmet, and few places to mount one should you want to. The style is a success – for the most part. It looks small and light, even when worn, and though it isn’t super expensive, it looks like it could be. The downfall is that it is, if anything, a bit too busy in the graphics. There are too many competing details to let any one of the stick out and exude that ‘cool factor’ that we want in a helmet. It’s also a bit ‘roady.’ Place it in a road category and nobody would bat an eye. Did they miss the mark for this category? We think so. A good hybrid helmet for road and mountain biking, very light. This lightweight helmet, by IREALIST, features high-grade PC and EPS construction, and is designed as a road-mountain hybrid helmet. It is only available in this white-black-green design (shown above). Also note that it doesn’t come with the visor – that’s an add-on. The vents are small, but well-placed, and the lightness of the helmet helps to keep scalp sweat to a minimum. When on, it doesn’t feel much different than a regular baseball cap – plus the straps of course – but it will take an impact like a pro. The straps are fully adjustable and include a sweat-absorbing chin pad that is machine washable. There are no reflectors or reflective tape or stickers on this helmet, so the white elements of the graphics make up the only visibility-enhancing feature, and its efficacy depends of course on the rider’s environment – against a light background, the colour will be of little help. Without the optional visor attached, the profile looks blunt – which is a common-enough look for mountain bikers – and it streamlines out a bit with it on. The wedge-shaped front edge rises to a peak at the rear, with horn-like aerodynamic features at the crown. Its styling is at home in a mountain biking context, or on the open road, so it’s a great helmet for the crossover rider who doesn’t want to buy two very specialised helmets and swap them up. A great-looking, breathable helmet, at home on the trail, but practical for roads and commuting too. This ‘ultralight’ helmet by SKL is constructed using PC and EPS In-Mould technology for protection and light weight. It is adjustable to 56-61cm in the large size category, and fits comfortably on the head with good stability once set. It has the feel and quality of a much more expensive helmet. It often arrives with the adjustment to the smallest size, so turn the LED light to get a loose fit, then dial it in from there. The 21 vents make for a cool ride, and airflow is good, even for riders with longer or fuller hair. There are mesh membranes over the front vents to protect from large insects and debris. Even in slower conditions we found this helmet to a cool, comfortable fit – almost like wearing a mesh hat. The straps are fully adjustable and feature a comfortable chin pad, but there are no locks under the ears. It includes and adjustable, red LED light on the cradle adjustment, with three settings (steady, slow flash, fast flash). If you want to use the helmet for commuting on roads, as well as off-road recreation, it works well. The lack of locks on the straps under the ears may be a problem for more intense mountain bikers (settings may slip, effecting the fit), but if that’s not a problem for you, the added bonus of the LED light and bright colours will suit road and trail alike. There isn’t a lot of room for unique looks when it comes to functional gear, but SKL has managed to set this helmet apart. The combination of the geometrical corners and the overall flow of the orange ridges have a nice effect, as does the detail of the carbon fibre print and black crown ridge. It comes out looking very technical, rugged, and a bit futuristic – especially in the orange. Overall: great work SKL! A good-looking helmet for downhill racing – but lacking safety certification. The Ventura Downhill helmet includes a face plate made of hard-shell ABS special nylon, and a removable chin guard. The vents are small and you won’t get the airflow in this helmet that will in any of the others, but as it is intended for downhill specialists, this will not be an issue for those who are interested in it. It fits more like a motorcycling helmet than a bicycling helmet (though it is not intended for use on motorised vehicles), and is secured using a single, padded chin strap. The helmet is not reflective at all, but that also suits downhill riding, as visibility in traffic or amongst other riders is not a priority. The helmet looks good, edgy up front with its jutting visor and chin guard, while sleek and understated in flat black around the shell. Please note: This helmet does not include any safety verification or certification. A solid full-face helmet for downhill ridinh – but lacking safety certification. This full-face offering from Diamondback features integrated chin guard and removable, adjustable peak visor. The padding is removable for easy washing. The helmet comes in small and large sizes, and it is important to note that, while most cycling helmets have a lot of adjustments to the fit, most full-face helmets don’t – and this is no exception. 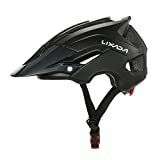 This helmet does not have much ventilation ability, and is more suited to colder weather or downhill riding than regular mountain biking conditions. It is secured on the head by a double D-ring and strap system, similar to traditional motorcycle helmet straps. There are no interior adjustments possible, and it can feel a bit snug at first, but will soften up after a few uses. This is about two factors: the size of the helmet, and the padding inside of it. In order to get the right size, measure around your head about 2.5cm over your eyebrows, as level as you can. Try it a few times to make sure you are as accurate as possible, but unless you are unusually big, or unusually small, you’ll do fine with an adjustable ‘unisize,’ large, or medium helmet. For downhill mountain biking in particular, you’ll want a snug fit to keep the helmet in place during prolonged jarring from travel over uneven ground. For the most part, there isn’t any structural difference between the two, but ladies’ helmets are usually available in more traditionally-female colour schemes, and sometimes in smaller sizes within the adult line. The size measurements do not differ between men’s and ladies’ helmets though, and any suitable, quality helmet will function without notable difference. Aerodynamic are a factor in any sport or activity where speed is measured, and mountain biking is no exception. For most cyclists though, especially off-road specialists, the difference between a standard helmet and a super-high-tech pro helmet is not going to be measurable. Helmets come in a number of general categories: Road, Aero Road, Time Trial, Mountain Bike, BMX, Leisure, and Full Face. Many lines also include a ‘Kids,’ or ‘Youth’ range. It is usually only the size and style that differ between youth and adult helmets. The quality along a price range is similar or identical. Mountain bike helmets tend to have more coverage, or a thicker shell – you don’t want a branch or sharp stone hitting your skull through an over-sized vent hole – and more padding. A fall from a mountain bike may or may not be at as high a speed as a road bike crash, but it can be into some pretty nasty terrain. They also tend to have additional chin padding. For the reviews below, we stayed with the mountain bike helmet category, with a few of them leaning toward a hybrid road-bike style. The more vents your helmet has, the cooler it will be, but there is less material there to protect your head from impact. There are standards to protect you from insufficient protection from a given style though. The helmets below all conform to the European standards (or better), but it’s always a good idea to double-check before buying any safety equipment, especially if it is manufactured abroad. The straps should be fully adjustable to fit below your chin and around your ears without pressing them painfully against your head. Because of the rough ride common to mountain bike trails, the fit should be snugger than a road bike helmet needs to be. This will prevent the helmet from shifting out of place during times of heavy vibration or washboard trail surfaces – not the best times to stop and adjust the fit! Clips or buckles should be solid, snap together firmly and smoothly, and the retention cradle (the part that goes around the back of your head, below the helmet shell itself) should be adjustable and fit flush against the lower rear portion of your skull, below the occipital bone. This keeps the helmet on your head upon impact from below. Your helmet should not shift from the set size, during vibrations due to rough surfaces. If it does loosen during your ride, we suggest you return it. It may be a faulty retention cradle or clip, but more likely the quality or design is not suitable for the intensity of your riding style. The system as a whole should keep the helmet in a firm-but-comfortable, stable position on your head, over any terrain. Visibility isn’t as big a factor for mountain bikers as it is for road cyclists, but that doesn’t mean it should be ignored. For those brief times you may be on the road, between trails, or between your home and a favourite spot to ride, you are just as susceptible to careless motorists as road cyclists are. Adding a light or reflector to your helmet is a good addition to your arsenal of passive safety tricks, and won’t disrupt your off-road ride. Many helmets come with integrated reflective features and/or lights, but those that don’t often have places where these can be added after purchase.